Description: In its south-north part the Suha Reka area comprises the valley of the Suha River with its belonging dry valleys. It is surprising that a hundred years ago the river was flowing all the way through, but owing to the cutting of the nearby forests, it has dried up in its middle and lower part. 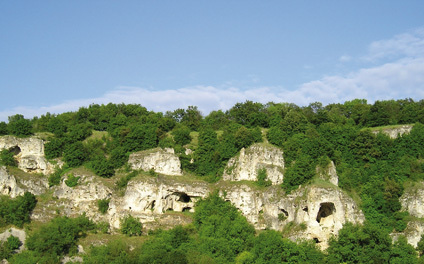 The valley has cut into the Sarmatian limestone of the Dobrogea plate and in some places it has taken the form of a gorge with 50-meter-high vertical cliffs. In some places there are forests of Quercus cerris, Q. pubescens and Q. virgiliana or mixed deciduous forests dominated by Quercus cerris, Carpinus orientalis, Fraxinus ornus here and there, ash and lime. The lower parts are covered by mesophytic and hygrophytic microthermal forests consisting of Quercus pedunculiflora and Q. virgiliana. The secondary vegetation consists of bushes (Amygdaleta nanae) and grass (Artemisieta albae, Agropyreta pectiniformae, Agropyreta blandsae, Brometa ripartii, etc. ), as well as of steppe and xerothermic formations. The xerothermic formations are dominated by Dichantieta ischaemi, Poeta bulbosae, Chrysopogoneta grylli and ephemerals. The abandoned agricultural lands are covered by mesoxerothermic vegetation. As far as butterflies are concerned, the region is not studied sufficiently. Sporadic, but comparatively new data were published by Abadjiev (2001) and Abadjiev & Beshkov (2003). The main reason for the inclusion of the region is the presence of 5 of the target species [see a list below], including a great part of the populations of Euphydryas maturna in Bulgaria. For the time being, the Suha Reka region is the only place in the country where the species Euphydryas maturna is widely distributed and common from the second half of June till the beginning of July. — Target species: Parnassius mnemosyne, Lycaena dispar, Euphydryas maturna, Melitaea trivia, Brenthis hecate. 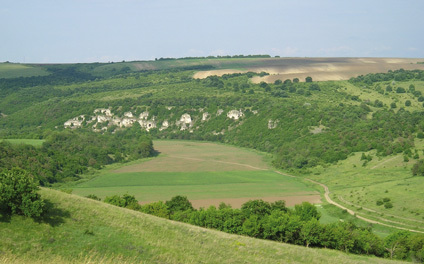 Views of the valley of Suha Reka with open Sarmatian limestones near Kranovo Village. Habitats of Parnassius mnemosyne, Lycaena dispar, Euphydryas maturna (Photo S. Beshkov, June 2006). Protection & threats: The main threats are connected with the regional development of the agriculture. The burning of the stubbles, although forbidden in the whole country, is a common practice and can lead to fires in the uncultivated lands and forests. The irregular tilling and sewing of the riverbed and its abandonment after the crop gathering leads to ruderalisation and replacement of the root vegetation by ruderal vegetation. As future management measures we recommend to avoid the planting of Robinia pseudoacacia and the hybrid poplar. 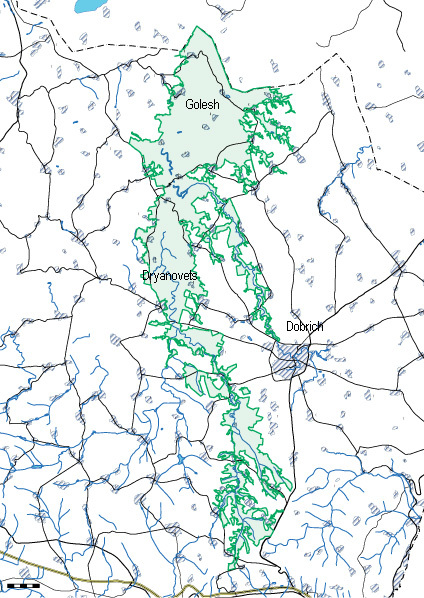 Also, the places grown with these two species should be restored by turning them back into their original state. Other remarks: There have been established more than 320 plant species, comprising 16 rare and endangered species, included in the Red Data Book of Bulgaria. The region is characterised by a wide variety of birds. As for the moths, the region is the only certain locality of Acontia melanura in Bulgaria. Some other rare butterfly species of conservation importance found here are: Paradrymonia vittata, Apamea epomidion, Acontia titania, Chelis maculosa. The region is promising and we expect that other species of conservation importance will be found there, including Pseudophilotes bavius which has not been established for Bulgaria up to now. It has been found in the dry valley of Suha River in the Romanian part of Dobrogea 1 km away from our border. Map of Suha Reka area.